Let the record show that we are getting just as tired about typing subject lines related to Chinese trade talks as you are reading about them, but that’s the story once again this morning as trade officials from both China and the US have agreed to resume trade talks in DC next week. That has turned what was a modestly negative tone to a modestly positive one as we close out the week and head into the long holiday weekend. In economic data for the US, Import and Export Prices were both weaker than expected, but the Empire Manufacturing report slightly exceeded expectations. 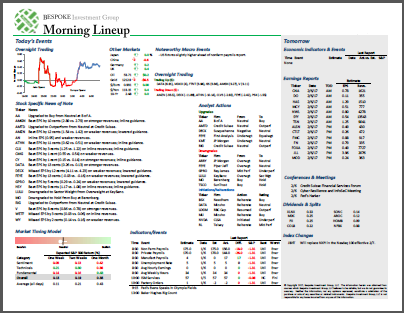 Read all about overnight events around the world and this morning’s news in today’s Morning Lineup. Along with the strong gains so far in 2019, we have also seen very strong breadth. 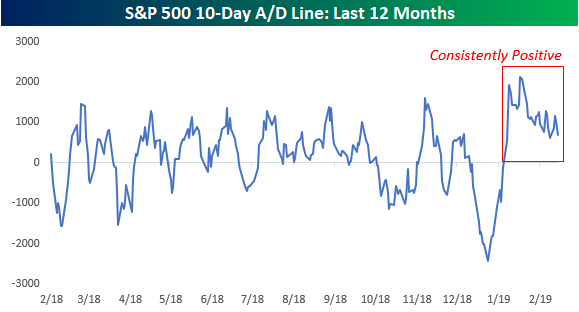 The chart below shows the 10-day A/D line for the S&P 500 over the last year, and while it has typically oscillated between gains and losses, it has been consistently positive now since early January. In fact, for 28 straight days now the 10-Day A/D line has been above +500, which is the longest streak in nearly three years (March 2016).